In cities all over the world, graffiti have become natural part of the cityscape. Tehran is not different. Most tags and slogans (and the more elaborate paintings) are officially sanctioned, relaying the messages and opinions of the government. Some are not sanctioned at all. This wall (larger image) was photographed in Darakeh just north of Tehran a few weeks ago. I saw the same tag down-town as well, but was never given a good opportunity to take a picture of it. The Persian text translates to “political disclosing” or “political divulging”. Unfortunately the site no longer exists. I wonder who was so brave as to create an oppositional blog and then draw attention to it by spraying the address all over the capital. 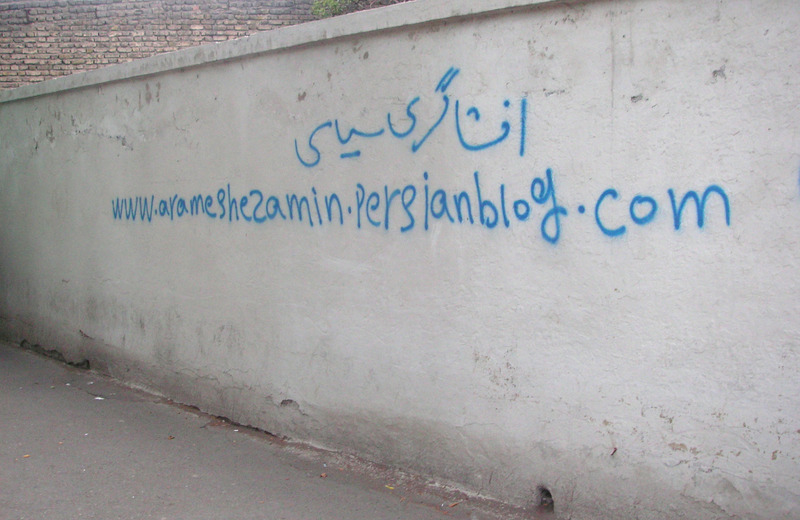 If anything, I think the picture shows how important blogs are for the Iranian public sphere. How desperately people want to be read and listened to, and what length some are willing to go to achieve it.